Another step in getting your motorcycle to perform at its best is to properly set the ignition timing. When adjusting the camshaft, ignition, and valves you’ll refer to the timing marks on your engine’s spark advancer. For anything ignition related, you’ll typically refer to the F mark. For mechanical adjustments, you’ll use the T mark. If you find you’re getting no spark at all, you may need to troubleshoot your electrical/starting system first. The ignition system is responsible for sending a spark to the plugs when the pistons are in the right positions – usually just before Top Dead Center. As the engine speeds up, the spark advancers works to manage when the cylinders get their spark. Your engine will likely either be equipped with a points or an electronic ignition to control the spark. When you set your ignition timing, you’ll either retard or advance the spark. In general, low compression engines will need more of a spark advance than a high compression engine. As engines wear, they loose compression overtime, which is why it is important to regularly check and time your ignition to keep your engine in top shape. 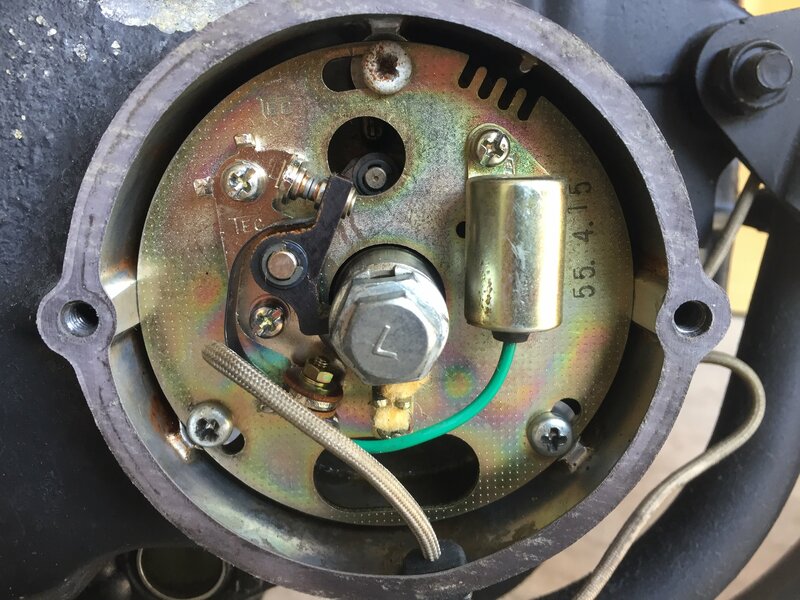 If you’ve just purchased an old motorcycle that’s not running, you should try to get it running with its points ignition before you decide to upgrade to an electronic ignition. The majority of motorcycles built before 1980 will have a points ignition. To ensure your spark stays strong and your engine runs well, you’ll need to inspect, reset, and change your points at normal intervals. If your points look worn, corroded, or pitted, you can replace them with a new set. New points will be much easier to set and can often eliminate some ignition issues. Condensers, the cylindrical component attached to your points plate can also be replaced relatively inexpensively, however, these tend to last for a long time. If you replace your points, be sure not to lose or forget to install the felt washers that go between the screws. This prevents certain parts from grounding out. You’ll need to set your spark advance at the right point just before Top Dead Center of the compression stroke. Most motorcycles that use a points place will have markings on the engine casing to help you find this position. You can confirm it statically with the engine off using a timing light or an Ohmmeter, and you can time the engine dynamically with a dynamic timing light. You’ll want to set the spark just as it lines up with the mark on the engine case. Turning the plate back and forth with advance or retard the spark. If you do this with the engine on and idling, you’ll hear the RPMs increase or decrease. You’ll want to find a position where the engine is not pinging under load or running too hot. Confirm your ignition timing is properly set with a timing light and by checking the color of your spark plugs. Turn the engine over until the points are at their widest opening point. With a feeler gauge that matches the thickness of the point gap specified in your shop manual, measure the gap. Adjust as necessary by loosening the small screws and moving the individual point plate up or down. Tighten the screws and remeasure the gap. Set the point gap correctly. Use a wrench on the large nut in the center of the spark advance (not the small nut). Connect an Ohmmeter or circuit tester lead to the positive wire from the points you are testing and ground the other lead. Look through the viewing hole in the points plate so you can see the marks on the spark advancer and the static mark on the engine case. Turn the engine until the “F” mark lines up with the mark on the engine case. At this point, the circuit tester light should come on (or the Ohmmeter needle should jump). If not, loosen the points plate screws and turn the points plate. Retighten the screws, turn the engine again, and confirm that the light/Ohmmeter matches the “F” mark). 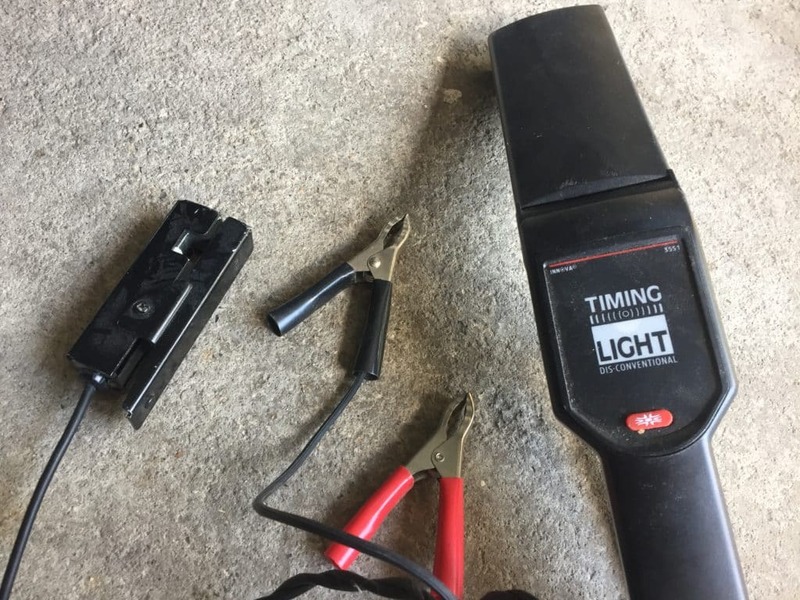 Hook up your timing light as per the manufacturer’s instructions. Start with cylinder 1-4 for a 4 cylinder motorcycle. Aim the timing light through the points plate view hole. Confirm that the “F” mark aligns with the engine case’s timing mark at idle. Rev the engine to about 3,000 RPMs and confirm the parallel advance marks line up with the motorcycle’s timing mark. Adjust the points plate forward or backward as necessary. Repeat for the other pair of cylinders.